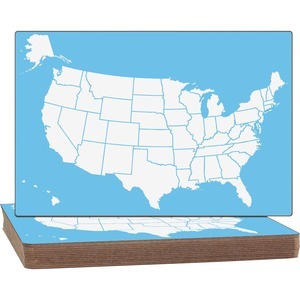 Dry-erase boards are ideal for learning U.S. states and capitals, identifying geographical features, showing weather patterns and more. With the borders of each state, including Alaska and Hawaii, clearly outlined, the dry-erase surface allows early learners to learn without the waste of worksheets. Students can write in names of states, state capitals and more again and again. Two-sided board is plain dry-erase on the back for versatile use. Rounded corners and smooth edges offer safety and comfort. Backing is warp-resistant and chip-resistant for lasting use.